Much like Simon Stephens’ other new play this year, Nuclear War, the title of Heisenberg: The Uncertainty Principle is not particularly indicative of the content. Heisenberg is a touching romantic comedy in which the uncertainty principle makes only the loosest of appearances. This presents no difficulty in itself – artists are of course entirely entitled to use whatever ideas they choose as a title for their work. However, perhaps it indicates something about the cultural climate in 2017 that producers can confidently borrow an otherwise esoteric scientific concept to market a main stream West End production. The Royal Court Theatre, which produced Stephens’ Nuclear War, also premiered Lucy Kirkwood’s new work The Children earlier in the year. This was a dark and reflective piece about the legacy of three retired nuclear scientists of the baby boomer generation. As thoughtful as The Children was, it was surely Lucy Kirkwood’s other major new work Mosquitoes at the National Theatre that was arguably the piece of standout science theatre in 2017. Mosquitoes is set at the time of the switch-on of the Large Hadron Collider (LHC) at CERN in 2008. 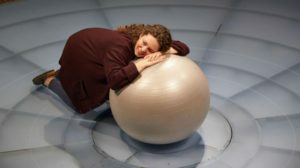 A play that includes a character called ‘The Boson’ immediately rings alarm bells over the risk of didactic dialogue and some superficially inserted science. Far from it, Mosquitoes delivered an absorbing and funny family drama with complex three-dimensional characters that we come to care deeply about. The scientific setting sits very comfortably within the play, complementing but not dominating the narrative. It is the tale of two sisters, Alice – a staff scientist at CERN (played by Olivia Williams) – and Jenny, her troubled and arguably naïve sister (Olivia Colman). Contrary to Alice’s high minded approach, Jenny has developed her own brand of tabloid-style scepticism and fact-free opinion that results in difficult consequences for her and her family. As a politician famously once said, ‘people in this country have had enough of experts’. Mosquitoes also features two relatable teenage characters who are grappling with their sense of place – both literal place (displaced from England to Geneva) and virtual (negotiating the brave new Snapchat world). 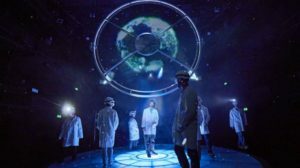 What Kirkwood and director Rufus Norris achieved with Mosquitoes is the rare combination of a full length two-act play that draws heavily on science and yet comfortably stands alone as an enjoyable, relevant and probing piece of theatre. It is the character of the sisters’ mother Karen (Amanda Boxer), a retired Cambridge scientist herself, who brings up the uncertainty principle in the form a joke told to her daughter (partially to alienate Colman’s less science-savvy character). The principle (and the joke) is never overtly explained for the benefit of the audience. If we are also to feel alienated rather than enlightened is something that we are left to decide for ourselves, much to the credit of the writer. Mosquitoes was not the only new play this year set around the opening of the LHC. The Royal Shakespeare company took this on as part of their Mischief Festival in the spring when Tom Morton-Smith (Oppenheimer 2015) delivered a one-act piece for ‘The Other Place’ studio theatre in Stratford-upon-Avon. The Earthworks charts an encounter between a science journalist and a postdoc researcher, also on the eve of the LHC switch-on. It’s a very neat little piece (on a similarly human scale to some of Nick Payne’s one act plays) with some fun science inserted (at one point non-Newtonian fluids are demonstrated live on stage with custard borrowed from the kitchen of an up-market hotel). The Earthworks offers a valuable new perspective that other ‘science plays’ have not yet really approached – a sense of the potential conflict between the need for click-friendly news nuggets to sustain modern online media and the more considered, often-long term nature of scientific research. There was plenty of great material to work with here and The Earthworks adds a great deal to the genre. However, towards the end of the play, real science is conflated with (albeit plausible) science fiction. This worked well to advance the narrative in a moving way, but it felt slightly disappointing to mix fact and (near) fiction in the same piece given that there is already so much great real science in the play. 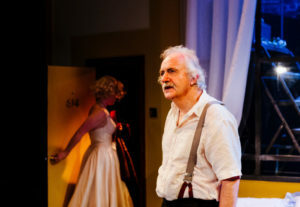 The confusion of fact and fiction is central to Terry Johnson’s 1982 play Insignificance, currently enjoying a revival at The Arcola Theatre in Dalston. The Professor, The Actress, The Senator and The Ball Player all meet in a fantasy encounter in a 1950s Manhattan hotel room. The contrivance works because the characters (although never named) are of course Albert Einstein, Marilyn Monroe, Joe McCarthy and Jo DiMaggio. It’s a fun and at times sinister piece with some great casting by director David Mercatali. The gentle Einstein (Simon Rouse), a flighty but vulnerable Monroe (Alice Bailey Johnson) and an oafish DiMaggio (Oliver Hembrough) spar and with each other and with the ruthless Senator McCarthy (Tom Mannio). Since Einstein is in nearly every scene it comes as no surprise that science makes an appearance. However it is in fact Monroe who gives a breathless and accurate summary of the principles of special relativity to The Professor in the first act, before the play goes on to explore some its darker themes. Shortly before the end of Insignificance Einstein makes a passing reference to the uncertainty principle. It drew a muffled but knowing response from members of the audience, who were perhaps conscious that this is not the only ticket in town with a bit of exposure to this particular piece of science. It was of course nearly 20 years ago that Michael Frayn so successfully wove the uncertainty principle seamlessly into the structure of Copenhagen at the National Theatre. It seems almost churlish to note here that none of the recent productions discussed above manage to replicate that sophistication. However, the prevalence of the uncertainty principle in 2017 demonstrates that audiences are increasingly comfortable to engage with science in a theatrical setting. And that seems to be one principle worth pursuing.